An analytical method based on liquid liquid extraction has been developed and validated for analysis of piperaquine in human plasma. Metoprolol was used as an internal standard for piperaquine. A HyPURITY C18 column provided chromatographic separation of analytes followed by detection with mass spectrometry. 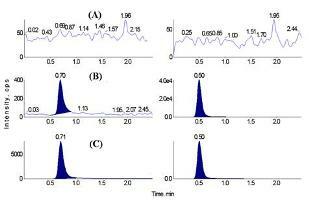 The method involves simple isocratic chromatographic conditions and mass spectrometric detection in the positive ionization mode using an API-2000 system. The proposed method has been validated with linear range of 5–1000 ng/mL for piperaquine. The intra-run and inter-run precision values are within 10.56% and 9.98% respectively for piperaquine at lower limit of quantification level. The overall recovery for piperaquine and metoprolol was 63.14% and 73.54% respectively. This validated method was used successfully for analysis of plasma samples from a bioequivalence study.